Description: A westbound intermodal with the Cleveland skyline as a backdrop. The building on the left is the old Cleveland Union Terminal "CUT" now served by RTA. Description: A going away photo of the CA11X. 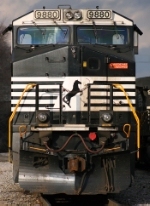 Description: A photo of NS D9-40CW 9880 wearing NS' "horse head" paint. Description: A going away photo of the CA11X returning lite to Pavonia Yard from High Hill Road. Description: Trailing unit, NS D9-40CW 9880. Description: NS 9880 leads 14G eastbound through Plymouth Township on the Morrisville Line. Description: Pair of Dash 9's await a signal to head west. Description: Two horsehead units wait to pull north towards Broadway, Timberville, NewMarket and Mt. Jackson, VA. Before the N&W/Sou. merger this line was traveled by The Southern making its way between Front Royal, VA. and Harrisonburg. Description: NS 9880 sits at the north end of the Pilgrim's Pride yard, on the ex-Southern R.R. main line. Description: The Pilgrim's Pride Feedmill is the tallest building in the valley! Description: from Wilcox Ave bridge. It will go under tracks at hump yard tower then to yard to connect to train. Description: A 9W and 2 8W's head east towards CP 88 with the 214. Description: 214 heads eastbound at Bethlehem. Description: Horsehead GE leads 2 ex Conrail C40-8W's and NS intermodal 214 EB at CP Beth. Description: NS 9880 and NS 7618 power a westbound trailer train. Description: 25N (9880) is past by 111 (9516) at the Bristol Yard Office. Description: NS 25N sits waiting for its turn while 111 speeds past on the siding. Description: Rarely caught (for me) NS move on the high line not involving H5A. 3 GE's haul 97 car hopper train 85E westbound through CP Field. Description: eastbound 97 car hopper train on the high line.